Dreams are not eternal. The things we do in this life, the organisms and organizations we create, have a lifespan. Leaves bud, flourish, brilliantly change color, then fall to the ground dead, shrivel up, and get consumed into the ever-turning, ever-recycling earth, destined to become nourishment for the next round of leaves budding in the warmth of the coming spring. So it was with Ember Church, my near-decade-long dream whose lifespan was all too short, lasting only a little longer than the leaves I just raked from my front yard. I had hoped that this church would take root and flourish for decades, outpacing my own life on this earth. But that’s not how it turned out. 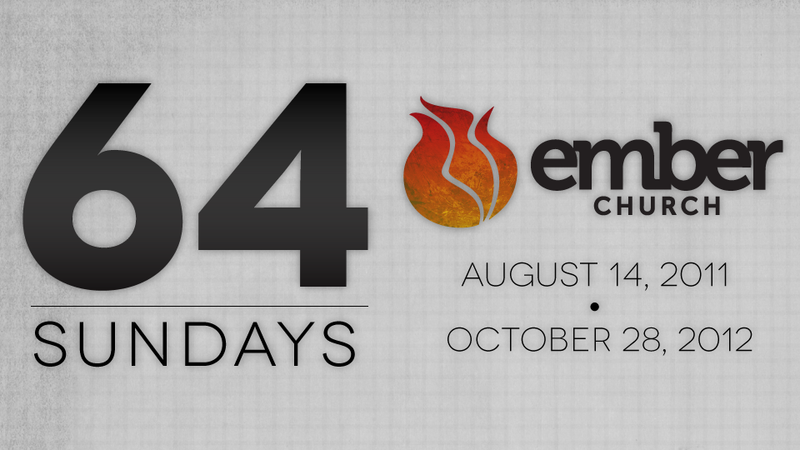 Despite my prayers and best efforts, Ember Church died young – just 64 Sundays old. Before we were married, I made a promise to my wife. I told her, “I will never sacrifice my family for a church.” I had heard enough horror stories of the rebelliousness of pastor’s kids, and I resolved that, as much as it was up to me, I would not push my kids into rebellion by putting the church before them. They, and my wife, would come first. And if I ever had to choose one or the other, I would choose the family. When we decided to step out in faith and plant Ember Church, we knew that I would have to do it bi-vocationally, meaning that I would work a full-time job to provide for the financial needs of the family, and use my spare time to pastor the church. We knew this would be extremely challenging, and would demand sacrifice from all of us in the family. We determined that we could do this for 2 years, and then we would re-evaluate the situation. The hope was, at least on our part, that the church would have grown large enough by then to support me in full time ministry. We were thrown two curveballs that caught us off guard. First, it took me a year to find a job. That process was brutal, and I really don’t want to relive it here. Suffice to say, it was a stressful and desperate year. The second curveball, however, was thrown with a full count in the bottom of the ninth, and it buckled my knees so hard I couldn’t even get the bat off my shoulder. That was Zeke’s epilepsy. The first seizure was in May, and the second in June. Then a third one in July. After that, things went downhill, and fast. He started having seizures about 10 days apart, and we wound up at the ER five or six times in about a month’s time. As his meds increased, so did his seizures. He went from developing slowly (but developing) to regressing. We didn’t know what was going on with him. He was losing words. He was losing motor skills. He was already developmentally delayed, and we had worked very hard to get him to where he was, but it was all slipping away. Before long Breena noticed that he was having tiny, micro-seizures throughout the day – lots of them. He would seize for a brief second at the top of the stairs, lose his balance, then tumble to the bottom. This happened a lot. All the words he had picked up through extensive therapy were gone, replaced by a loud, frustrated, “Enh!” He was descending into physical and mental chaos. I made an offhand comment in one of my sermons at Ember that chaos is the defining characteristic of hell. Zeke’s chaos translated into chaos in our family, and the only word I could find for it was hell. Despite our prayers, despite the medication, Zeke just kept getting worse; and the deeper into chaos he spiraled, the more closely we followed him. Our lives became a living hell. All the while I was trying to pastor this church that I loved and believed in, but that hardly anyone came to. Ember wasn’t growing; it was shrinking. And that’s hard to do when you’re a small church to begin with. I was discouraged. I was angry. I didn’t know what to do. I felt my son and my church slipping away. It was time to call it. I couldn’t go on. If I persisted with Ember, it would cost me my family. I would have broken my promise to Breena, made almost eight years earlier. I would have sacrificed my family for the church. While the Son of God was an acceptable sacrifice to God for the sake of the world, the sons and daughters and wife of Andy Holt are not. The following week we had a celebration dinner, telling stories of what God has done through the 64 Sundays we had together as a church. It was beautiful, and it broke my heart. To the people of Ember Church I want to say this (and I know you’ll say that I don’t need to, but I do): I’m sorry. I’m sorry that this beautiful little church didn’t survive. I’m sorry that I couldn’t do more to make it last. You all said such wonderful things at our celebration dinner, and for that I’m grateful. I’m glad we got to do that. I remember a lot from that night, but one thing stands out: Mary, who always seems so happy, standing up and, through tears, telling us that Ember is the only place where she knew it was OK to not be OK. That got me. I’ll always remember the Jeremiah series, and hopefully I’ll write that book someday. I’ll always remember the two baptismal services, and dunking Somers, Becca, and Cody the Guy I Didn’t Recognize Because He Shaved His Beard in that freezing cold baptistry on New Year’s Day. (The second baptism service, when I baptized Mary, Ian, And Dustin on Easter, was much more comfortable.) I have a lot of other memories that I’ll always treasure, and I hope you do too. We only got 64 Sundays, but they were beautiful and difficult and wonderfully worth it. And now that this leaf has fallen to the ground, I hope and pray that it will enrich the soil of the wider Church, and that you who were a part of Ember will nourish and flourish wherever God takes you. Thanks for the post and your vulnerability. I really do not have great words of wisdom except the comfort of affirming that you are doing the right thing by putting your family first. Blessings to you, Breena, and your family. I also hope that God’s miraculous power will heal your son and if not, provide you enough grace to understand him more through his sickness. Thanks JT, I appreciate it! Andy, I met you briefly at the ARC conference this past April. You may remember my husband (Mike – a bigger guy with long hair and beard) better than you do me. Anyway, this is a very meaningful post for me. I remember praying, with our first church plant and now with our upcoming 2nd, that God would give me the courage to trust him even if our church “fails”. None of this stuff is about us. It all belongs to God. And his plans for us are SO MUCH BIGGER than the plans we have for ourselves. And I want to be open to the possibility that his plan includes us failing. I commend you for committing to your wife and family above the church. As you said, not enough pastors are brave or humble enough to do this, and so many ministries suffer as a result. I believe that God will bless your obedience in serving your family! I am praying for all of you. I am praying that Christ will be more glorious to you through all of this and that he will be enough for you and your family.